You'll know your wine is preserved just by listening. You'll know your wine is preserved just by listening. With the sound of a simple click, the Vacu Vin stainless steel wine saver is a vacuum pump, which extracts the air from the opened bottle, clicks when you've reached optimum level and re-seals the wine bottle with a re-usable rubber stopper. The vacuum slows down the oxidation process so that you can enjoy your wine for days. Stainless steel. Includes vacuum pump, 2 re-usable rubber stoppers, and 2 pourers. Fits up to a Magnum-sized bottles. How does it work to preserve the bubbly in champagne? BEST ANSWER: Fair. Second day is pretty good. By third day, more flat than bubbly. But there isn't a preserver on the market I know of that will preserve the CO2 well after the cork has been popped. This will remove the oxygen that blankets the wine. It works for around 3 days. It will not touch the CO2 that is located in the actual champagne. The vacuum should ensure it goes flat a lot faster. Probably not what you want. How do you work it. Have one but it didn't seem to seal. Can you just lift off the cork after use without breaking the seal? BEST ANSWER: Thank you for your question. In order to use this product first insert the stopper and then apply the pump on top of the stopper. Next hold these two parts together with one hand while using the other hand on the pump to vacuum the air out. Once the air is sufficiently removed, the stopper should click, which lets you know the seal is in place. Once the stopper is removed, the seal is broken and needs to be re-vacuumed. I just ordered a Wine Enthusiast 6 bottle wine refrigerator. Will an opened bottle with one of the Vacu Vin stoppers fit horizontally in the refrigerator? BEST ANSWER: The inside of a 6 bottle unit is only 2 bottles wide so it will not fit horizontally. If you put the bottle in the standard way with the bottom of the bottle in first it will fit. Depends in the size of the refrigerator. No one says if this is for a 3 liter bottle. Is it? BEST ANSWER: The Vacu Vin Stainless Steel Vacuum Wine Saver can be used on bottles as large as magnums. It does not work on a 3 liter bottle. How long will red wine last if I use the Vacu vin system? BEST ANSWER: On average 3 to 4 days. We bought this item years ago before it had a "click" mechanism and use it all the time. I open a bottle of wine, drink one glass, use the vaccuum, and may not drink another glass for a week. To me it tastes like I just opened the bottle. I store the bottle upright, so the rubber stopper doesn't even touch the wine and can just be rinsed off and ready for the next use. I bought another one to give to my brother for Christmas. It allows wine to last for days without deteriorating. I drink a bottle of red wine over several days and the flavor stays the same when it is stored in a vaccuum. You want some wine, but you don't want to waste it or feel compelled to drink the whole bottle? Try this out. It does a good job of pulling a vacuum on the bottle to help preserve the wine for up to 10 days. So, it was a good way to have a nice glass of wine but not feel rushed to finish off the bottle. This by far, is the best buy! It's inexpensive and truly does what it says it does. I have saved so many bottles of wine since I bought this. I can have a couple of glasses on a Sunday, vacuum seal it and it's still fresh by Friday when I am ready for a glass of wine! Each generation of this device works quicker and easier. Does the job fast and easy. Perfect for those who want to have "a" glass of wine with dinner each night. perfect for the occasional wine drinker. I go through about a bottle every 3-4 days and now every single time from the first to the last glass....it tastes fresh every time. A must have for your household if you like wine with dinner and are sick of having to feel obligated to drink the entire bottle so it doesn't get wasted. I love this product! It was a pleasant surprise to find the pump came as a set with wine corks and pours...definitely worth the money! I bought one for myself and love it! Works well, "click" is pretty audible, telling me a vacuum has been atrained. I recently bought one as a gift, and NO CLICK!!! I will be contacing you for an exchange. So there you have it! 2 within a month and one works well, the other does not . A must have for any size collection. Very simple to use, yet sleek design. It's a true wine saver. I am a bartender for an upscale restaurant and this product preserves our wine perfectly. Not a heavy drinker. This helps keep the wine fresh so I can enjoy it another day. the best feature is the reassuring click, which tells you the vacuum has been achieved. This is the best product I'e ever used to seal an open bttle. Finsihing it off days later is no problem as it will tase like you just opened it for the first time. Make sure you get the bottle at the right hieght and the effort needed to use it is minimal. Has always worked easy & well! I've owed one of these before and it worked great! Left the old one at someones house and needed a new one. If you drink wine and don't finish the bottle...this is a must! You will be able to enjoy the rest of it the next evening! Easy to use and buy some extra stoppers since it only comes with 2 and (for me) easy to lose. Perfect if you drink only a glass a night and want to keep the remaining wine fresh and drinkable for several days. Excellent and easy to use. Have the old white plastic one, which still works by the way....bought this one as a gift. It was easy, once I got the hang of it. The directions need to be more precise. I use this when I open up a bottle of wine and don't want to drink the entire bottle. I have been looking for something like this for awhile. It does exactly that, it preserves the wine for several days so that you can enjoy a single glass or two of wine at a time. Great gift along with the Vinturi wine aerator. We have enjoyed this product because it does allow us to save wine when we don't finish it. We have had wine after using the sealer 3 days later and it tasted fine. We also have really enjoyed the drip catchers which clean very easily in the dishwasher. This product is extremely easy to use and works great! A "must have" for all wine lovers, especially when you have enough wine left over to save for another day. Reseals the bottle and you don't have to struggle to get a cork back in the bottle. What makes this product superior to other wine savers is the feedback click when the vacuum is established. No more wondering whether you've pumped out enough air. It seems to hold the vacuum for at least three days, which should be enough for anyone. This is the best, reasonably priced wine keeper that I have seen to date. Does exactly what it says. Now I can enjoy my wine without worrying about trying to drink it quickly before it starts to go down in quality. Extends the life for about two weeks! The included stoppers are much better than re-using the cork and the pour spouts are also nice. Would make a great gift for a wine drinker. It works. That's what is important. I use the Wine Saver to keep a good wine for two, sometimes three days. No waste or bad wine. I would most definately buy this again! Finally, something that really works to save wine. The vacuum wine saver is so much better than my previous (different brand). It's very easy to use and, more importantly, helps keep my wine fresh. Enjoy to the last drop! I'm the only one who drinks red wine so a bottle will last me several weeks. With this easy to use and affordable vacuum, I don't have to waste any of that good wine. Highly recommended! Its great, easy to use, especially for those who do not drink the whole bottle of wine, great way to preserve longer. The best part about this unit is that you actually hear a "click" when it is done. Other products in the market don't do that. I have several different types of wine savers, and this is definitely the easiest to use and very economical. It saves my whites and reds. I travel with it too. I have given quite a few as gifts. Save that great bottle of wine! Wine Enthusiast delivers on time, every time. This product provides a simple and effective way to preserve wine. I've used other vacuum pumps but this one seems to be the best. Just a few pumps and you are done, so much better than the previous one I had. This works great. The stoppers hold the vacuum for a long time (days) and are easy to clean. The click at max vacuum is a good feature. The vacuum appears to be adequate. The Vacu Vin, is very easy to use. It only takes a few seconds to preserve that unfinished bottle of wine! It is very easy to use and makes wine taste so much better once it has been open. Had one of these for years and it works well and has held up well. Have give it as a gift several times. It's great! I can't tell you how many bottles of wine have been wasted because we didn't want to drink the whole thing in one sitting. 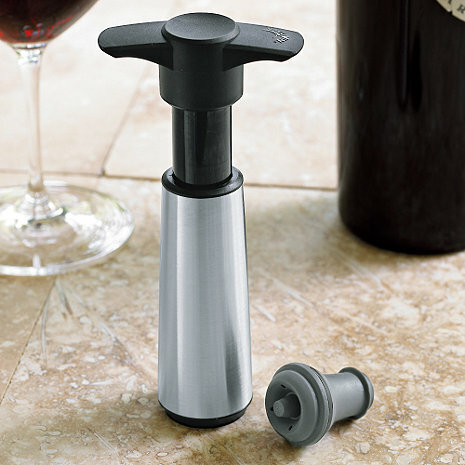 The Wine Saver keeps the wine's full flavor between 7-10 days. We haven't waited any longer than that to try to save it so I'm not sure of it's max capacity for freshness. Bottom line, it was well worth the cost and we are very happy with the purchase! Great feel to it vs the all white plastic version. Who knows if it really works, but it’s fun making the effort to do so! I've used a Vacu Vin for at least 20 years, and it finally called it quits after Christmas. I ordered a new one, and it works fine, just like the first one.